So Dennis Rodman is the loose canon and the voice of America in North Korea. Isn’t that special. Rodman claimed his visit and this game was a great idea for the world. Hey Dennis, don’t tell the dead uncle of Kim Jong Un that it was a great idea. We would have liked to have reached him for a comment, but it turns out he has been executed. After seeing Rodman loses his cool with Chris Cuomo, and the unintellectual rant he goes on, I think it is no wonder to anyone why the North Korean leader, Kim Jong Un, is his friend and he loves his friend. 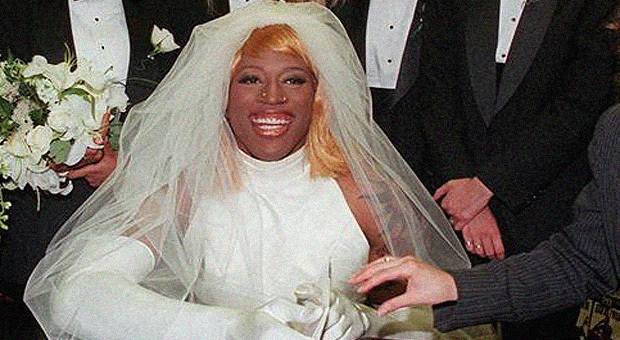 Watch Rodman go mental … then again, how is that any different than the last 25 years? The trip takes place just weeks after North Korea shocked the world by announcing the purge and execution of Kim’s once-powerful uncle. There are also concerns for the welfare of U.S. citizen Kenneth Bae, who’s been detained there for more than a year. The other former NBA players are due to take part in a controversial basketball game on the birthday of Kim Jong Un, the country’s young, unpredictable leader. The friendly contest with North Korea’s team is planned for Wednesday, when Kim is believed to turn 31. Asked if he would take the opportunity to ask North Korean leaders about Bae, Rodman suggested the Korean-American had done something wrong but did not say what that was. Just how ignorant are the former NBS basketball players who accompanied Rodman to North Korea, maybe the following statement will give you an idea. Really? Do you keep up with current events there buddy? Let alone, who thinks that it is ever a good idea to do anything that Dennis Rodman would come up with? “We’re apologetic we did not know that it was going to take this type of negative spin on what we were doing because we’re not politicians, we’re not ambassadors,” Smith said. File this one under why you don’t let idiots go to an oppressive Communist country and become “useful idiots” for propaganda. Some called it ”BASKETBALL DIPLOMACY”, personally I call it IDOCY and more Dennis Rodman attention seeking behavior. What a joke. Is this what we have come to in the United States in allowing a fool like Dennis ‘The Worm” Rodman to act as an ad hoc diplomat? Then again, John Kerry is now in charge of the State Department, I guess anything is possible. Why would anyone take this clown seriously? Former NBA bad boy Dennis Rodman and attention seeking whore who thrives on the outrageous recently visited North Korea and spent time palling around with communist dictator Kim Jong Un. However, after returning to the US, Rodman told reporters that Barack Obama and Kim Jong Un could bond if they shot hoops. Wow, who knew that North Korea would stop threating to nuke America and killing their own people if Kim Jong Un and Obama played a game of HORSE or played some one on one? WTF!!! Rodman stated in his interview on ABC’s ‘This Week’, that Kim Jong Un wanted Obama to call him. I almost have to ask why the media even interviewed Rodman and gave anything he does credibility. 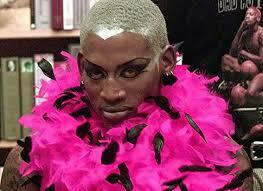 Rodman is a fool, an attention seeking fool. Nothing more. Either Rodman is ignorant to the fact of what actually goes on in North Korea, or he does not care. North Koreans are being unjustly imprisoned and they are being starved to death and we have a bridal dress wearing Dennis Rodman allowed to go there and act like this brutal leader is like everyone else. Unreal. Just curious, why did State Department allow this A$$ clown to go there? DENNIS RODMAN, otherwise known as a “USEFUL IDIOT”. During the interview with George Stephanopoulos on ‘This Week,’ Rodman kept referring to Kim Jong Un as his friend and a good guy. When pressed about the prison camps, the lack of human rights and the murderous North Korean regimes, Rodman made excuses and said that “we do the same thing here”. REALLY? As reported at Mediaite, Dennis Rodman ‘Won’t Apologize’ For ‘My Friend’ Kim Jong Un’s Murderous Regime: ‘We Do The Same Thing Here’. Check out Rodman’s comments below that the US has death camps and that the North Korean dictator is his friend. Some how an ignorant Rodman is able to over look the killing and starving of people because the dude is his friend. Newsflasf to Dennis, the North Korean people do not respect Kim Jong Un, they fear him. If they showed the slighted bit of opposition, they would be imprisoned or killed. “I don’t condone that. I hate the fact that he’s doing that. I didn’t talk about that. I saw people respected him, his family. He’s only 28. He’s not his dad. He’s not his grandpa. He is 28 years old. He’s very humble. He’s a very humble man. He don’t want war, that’s one thing he don’t want. He loves power. He loves control, because of his father, you know, stuff like that. But he’s just…he’s a great guy. He’s just a great guy. You sit down and talk to him,” said Rodman. “This is all politics right? He don’t want to do that,” said Rodman. “It sounds like you’re apologizing for him?” said Stephanopoulos. “No, I’m not apologizing for him. He was a great guy to me. He was my friend. I don’t condone what he does. But as a person to person, he’s my friend. What I did was history. He’s a friend to me. That’s about it,” said Rodman.